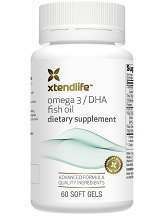 What is XtendLife Omega-3/DHA Fish Oil? This review for XtendLife Omega-3/DHA Fish Oil will help inform and advise customers on whether or not to purchase this product. XtendLife Omega 3/DHA Fish Oil is a dietary supplement. It is meant to improve one’s overall health and help make the recommended daily Omega 3 requirement. It is marketed in New Zealand, and can be found on a few online websites, including the manufacturer’s site. Helps improve cholesterol and blood-sugar levels. Strengthens the heart, brain, and joints. The pills are enteric-coated. This is so the pills will dissolve in the intestines in order to prevent fishy burping. XtendLife Fish Oil has simple directions. For bottles with 30 servings (60 capsules), take two pills a day. For bottles with 15 servings, take four pills a day. Children over the age of 6 can take one pill a day. The pills can be taken all at once, or gradually throughout the day. They do not have to be taken with food. XtendLife is selling a 60 capsule bottle for $17.95. Although, XtendLife members can purchase it for $16.16. There is no cost to become a member. XtendLife fish oil is also available on Amazon for $17.95, plus $6.50 for shipping. High doses can cause clotting. These side effects are accredited to consuming fish oil in general and are not specifically caused by XtendLife Fish Oil. Other problems are not caused by the pills themselves, but the way they arrive or are transported. For pills that have been exposed to high temperatures during transport, or arrive leaking and broken, do not take them. XtendLife offers a no risk guarantee. Customers have 365 days to return their product for a refund. To send back a product, customers must provide their name, order number, product name, batch number, expiration date, and why it is being returned. According to the majority of reviews, XtendLife Fish Oil is an effective product. It is a good diet supplement that gives users nutrients such as Omega 3. The majority of users do not experience any side effects that other Omega 3 supplements cause. However, XtendLife is slightly more expensive than other fish oil supplements that have the same benefits as XtendLife. According to one report, it is not Kosher or Halal certified, and it is not suitable for vegetarians. It also contains other fatty acids that do not have any benefit and are easily found in other foods.